The Bharatiya Janata Party (BJP) on Sunday named six more candidates for the Lok Sabha elections in Rajasthan, Haryana and Madhya Pradesh. In Rajasthan's Dausa seat, the BJP candidate Meena is a veteran leader and has worked as the Union Minister of State in the Atal Bihari Vajpayee government. She was elected an MP from Sawai Madhopur in 1999. 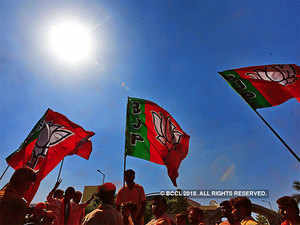 New Delhi: The Bharatiya Janata Party (BJP) on Sunday named six more candidates for the Lok Sabha elections in Rajasthan, Haryana and Madhya Pradesh. Finalised by the Central Election Committee, the names include Jaskaur Meena from Dausa in Rajasthan, and Arvind Sharma from Rohtak and Brijendra Singh from Hisar, both in Haryana. Bishnu Dutt Sharma will contest from Khajuraho, G.S. Damor from Ratlam and Chattar Singh Darbar from Dhar -- all in Madhya Pradesh. Arvind Sharma, a former Congress MP who recently joined the BJP, has been pitted against Deepender Singh Hooda, son of former Haryana Chief Minister Bhupinder Singh Hooda. Brijendra Singh, an IAS officer and son of Union Minister Chaudhary Birender Singh, will start his political journey from the seat which his father won in 1984 by defeating former Chief Minister Om Prakash Chautala. Brijendra Singh, a Haryana cadre IAS officer of 1998 batch, is posted as the Managing Director (MD) of the Haryana State Cooperative Supply and Marketing Federation. Hisar seat is represented by Dushyant Chautala, who recently formed Jannayak Janata party (JJP) after quiting the Indian National Lok Dal. In 2014, Chautala defeated Kuldeep Bishnoi of Haryana Janhit Congress by a margin of 31,847 votes. He is the only person from the Chautala family to have won the seat so far. In the 2011 Lok Sabha by-poll, Dushyant's father Ajay Chautala was defeated by Kuldeep Bishnoi of Haryana Janhit Congress by 6,323 votes. In Madhya Pradesh, the party has denied ticket to Dhar MP Savitri Thakur and fielded former MP Chatar Singh Darbar. A two-time former BJP MP, Darbar has been pitted against Congress' Dinesh Girwal. RSS veteran Vishnu Dutt Sharma will take on Congress' Kavita Singh Natiraja in Khajuraho while Jhabua MLA G.S. Damor has been pitted against former Union Minister Kanti Lal Bhuria in tribal dominated Ratlam-Jhabua parliamentary constituency. The BJP also announced Pratush Kumar Mondal as its candidate for the by-poll to West Bengal's Uluberia Purba Assembly constituency.